Saasu connects to your bank and loads new transactions into your Inbox. Saasu also suggests transactions (blue suggestions) in your Saasu file that match data in your bank feed. You can tick these using the icon provided if it looks correct. If no suggestions exist you can create (plus icon) or search (magnifying glass) for transactions easily from this area until you clear your inbox. Click the summary (highlighted in yellow when you hover) for each bank feed item to change it to something more meaningful for you. The edited summary will be used when creating Saasu transactions from the bank feed item. Click the Revert link that displays beside the modified summaries to reset them to the original bank summary. When possible, Saasu will suggest existing transactions in your file which may be matches for your bank feed items. These will display below each of your bank feed items in blue. To accept a suggestion, click the Accept button that displays when you hover to the right of the suggestion. Saasu matches the bank feed item with the existing bank transfer, purchase payment, or sale payment. Saasu creates the sale/purchase payment transaction using the details of the bank feed item, and matches the bank feed item with the new sale/purchase payment. To view/edit the suggested transaction, click the Edit button that displays when you hover on the right. If there are no suggestions for a bank feed item, or none of the suggested transactions match, you can search for other existing transactions in your file to match with the bank feed item. Click the Search button to the right of the bank feed item and choose the transaction type to search for (eg Unpaid Sales) – This will replace the suggestions list with the Match with… dialog. Search/refine the results within the dialog using the available filters. Once you’ve found the transaction/s, select these and click the Match against selected button. You can view/edit the transactions by clicking the Edit icon to the right of the row. If a bank feed item does not match any existing transactions, you can create new transactions using the bank feed item details. Select one or more bank feed items. Click an individual feed item (or its checkbox) to select/deselect it. Click the checkbox in the header bar to bulk-select/deselect the feed items on the screen. Select the transaction type from the Create As menu. Click the Submit button to e.g. Create Service Sales with Payments from the selected bank feed items – Saasu will create transactions using the combined information from the bank feed item (date, amount, summary) and the form fields (account, tax code, contact, tags, etc). It will then match the bank feed items with the newly created transactions. NOTE: The steps below can apply to transactions such as sales and/or purchases. The example below shows for a sale transaction. Select the magnifier icon >> Click “Sale Payment”. Use the left hand check boxes to select each of the payments to match against the bank feed transaction. The total of the selected payments must match the total of the bank feed item. You can match up to 25 payments to a single bank feed transaction at any one time. Note: You can only match multiple payments to a single bank feed item in the base currency of your file (eg. if you have an Australian file then the multiple payments you match must all be AUD). If you have a mix of base currency and foreign currency transactions to match then this will need to be handled via a clearing account. Select the magnifier icon > click “Unpaid Sales”. A list of unpaid sales is shown where you are able to select multiple sales and apply payment against it. From the Matched or All view, select the bank feed items to unmatch. Click the Unmatch action link above the header bar. Alternatively, you can unmatch bank feed items individually by clicking the Unmatch button for each feed item. IMPORTANT: Unmatching a bank feed item does not delete the Saasu transaction that the bank feed item was matched with. You may need to locate the Saasu transaction (i.e. the sale, purchase or bank transfer the bank feed item was matched with) separately and delete/reverse it if necessary. Select the bank feed items to delete. Click on the Delete action link above the header bar. NOTE: You can only delete unmatched bank feed items. To delete a matched item, you will need to first unmatch the feed item and then delete it. Once you delete a bank feed item it will be moved to the Deleted folder. If you realise you deleted a bank feed entry in error, this is how to Un-delete the deleted bank feed entry and move it back to ‘Inbox’. From ‘Inbox’ drop down to ‘Deleted’, select the bank account. This will list all the bank transactions deleted under the bank account. To un-delete select ‘Undelete this transaction’. This bank transaction will appear in your bank feeds ‘inbox’. If you create a pay run for multiple employees, you can either match this pay run entry to a bulk payment for the same amount from within your bank feed, or each individual employees payment amount, depending on how you pay your employees. If you have paid the exact amount, these should appear as blue suggestions. A common situation when dealing with payroll is needing to match one payroll entry with two separate bank feed transactions, or to match two separate payroll entries to one bank feed transaction. In Saasu this is done by using a clearing account to combine the entries into one. I have one payroll entry and two bank feed transactions. Create a clearing account (eg set up a bank account called Asset: Payroll Clearing). You can do this by clicking on Add > Bank Account > Name it a clearing, asset account. The total amount will now be in the clearing account and you can create two Journal entries (Add > Journal) that Debit the clearing account and Credit the actual bank account to match with the two bank feed transactions. I have two payroll entries and one bank feed transaction. The total amount will now be in the clearing account and you can create a Journal entry (Add > Journal) that Debit the clearing account and Credit the actual bank account to match with the one bank feed transaction. With multi-currency plans you can also use the Bank Feed service to match your foreign currency payments. Note: XE.COM has been unchecked, because we are using our own conversion rate. Enter the foreign currency amount and hit enter. You should find that a suggestion will automatically appear. Simply click on the tick to reconcile. Note: This is for foreign currency invoices without a payment already applied (whether manually or via a previous instance in Bank Feeds). You can only download foreign currency transactions from local Bank Accounts, and not foreign bank accounts. E.g. your base file currency is in AUD and you have two different bank accounts – one in AUD, one in USD. You can download data from your AUD bank account but not your USD bank account. You may need to allocate a transaction in your Bank Feeds Inbox to more than one account in an order or invoice. Open each transaction and then add an extra line to the transaction using the + icon to the right of the line item. 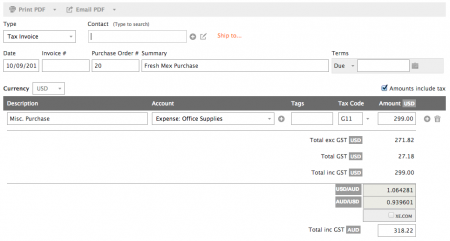 Split the amount on line 1 in the order or invoice to be across line 1 and line 2. Save the transaction and repeat for any other that need to be split.